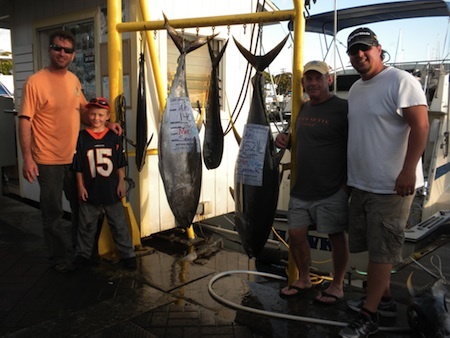 Dan, Jessie, Scott and Jimmy with 140 lb and 152 lb Ahi's! 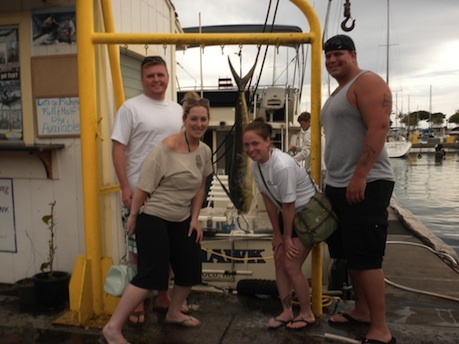 Mahalo to Dan, Jessie, Scott and Jimmy for choosing Maggie Joe Sport Fishing! The guys joined us aboard the Sea Hawk on a full day sport fishing charter. They hauled in a pair of nice Ahi’s while deep sea fishing outside of Honolulu, Oahu! Aloha! Jamie, Auston, Oleg, Reed, Thomas and Nadia with 3 Ahi's! 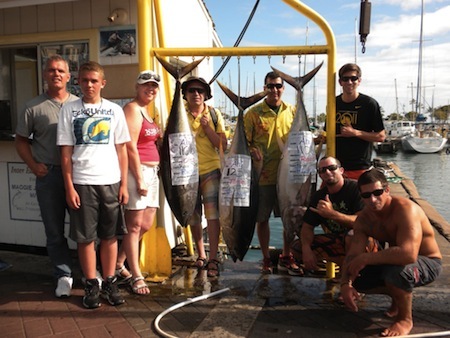 Mahalo to Jamie, Auston, Oleg, Reed, Thomas and Nadia for choosing Maggie Joe Sport Fishing! The group joined us aboard the Ruckus on a full day sport fishing charter. They hauled in three nice Ahi’s while deep sea fishing outside of Honolulu, Hawaii! Aloha and Hana Hou! 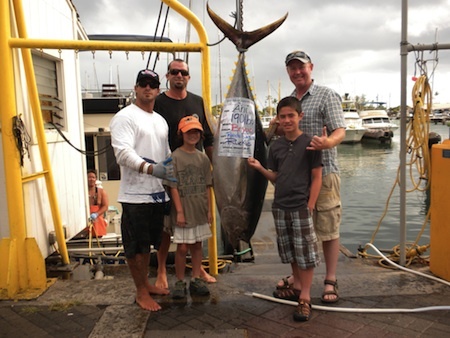 Brian, Devon and Finn with 190 lb Ahi! 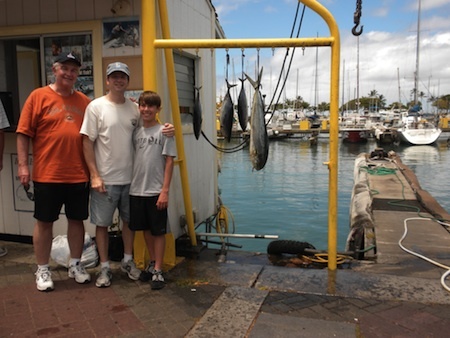 Mahalo to Brian, Devon and Finn for choosing Maggie Joe Sport Fishing! They joined Captain Russell and Mate Jeremy aboard the Ruckus on a sport fishing charter. While deep sea fishing outside of Honolulu, Oahu they hauled in this huge 190 lb Ahi! Congratulations! Jake and Cloey with Mate Mikey and 155 lb Ahi! Mahalo to Jake and Cloey for choosing Maggie Joe Sport Fishing! They joined Mate Mikey and Captain Matt aboard the Sea Hawk on a full day sport fishing charter. While deep sea fishing outside of Honolulu, Oahu they hauled in this nice 155 lb Ahi! Aloha! Zack, Doug, Bob, Jeff and Adam with Captain Matt, Mate Mikey and pair of Ahi's! Mahalo to Zack, Doug, Bob, Jeff and Adam for choosing Maggie Joe Sport Fishing! The guys joined us aboard the Sea Hawk on a full day sport fishing charter. 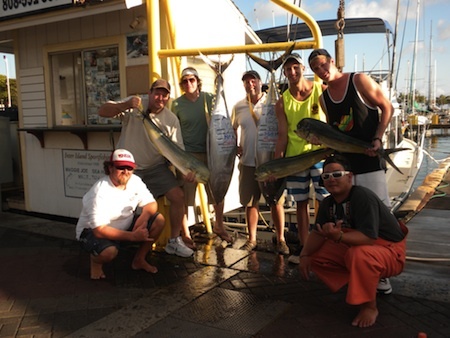 After departing Kewalo Basin, next to Waikiki, they hauled in a pair of nice Ahi’s as well as 4 Mahi Mahi! Congratulations and Hana Hou! 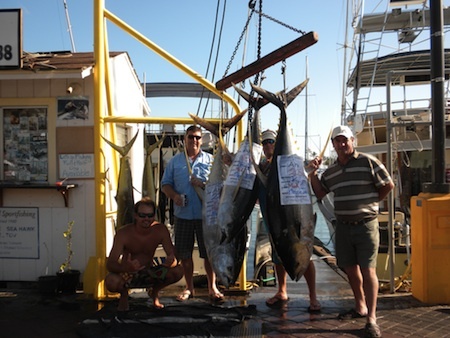 Kevin and Rodger with 220 lb and 118 lb Ahi's! Mahalo to Kevin and Rodger for choosing Maggie Joe Sport Fishing! The guys joined Captain Mark and Mate Sean aboard the Maggie Joe on a full day sport fishing charter. They hauled in 2 huge Ahi’s while deep sea fishing outside of Honolulu, Oahu! Aloha! Frank, John and Derek with catch! John, John and Roland with catch! 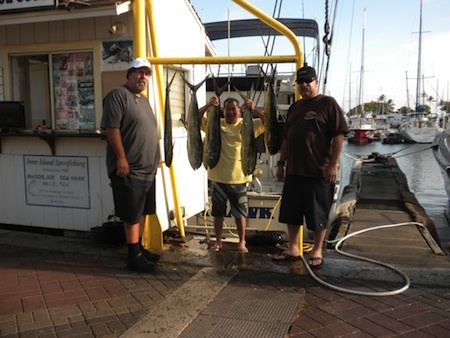 Mahalo for John, John and Roland for choosing Maggie Joe Sport Fishing! The guys joined us aboard the Ruckus on a half day sport fishing charter. While deep sea fishing outside of Honolulu, Oahu they caught 3 Aku and 1 Mahi Mahi! Aloha! Courtney, Keith, Kimberly and Mike with Mahi Mahi! 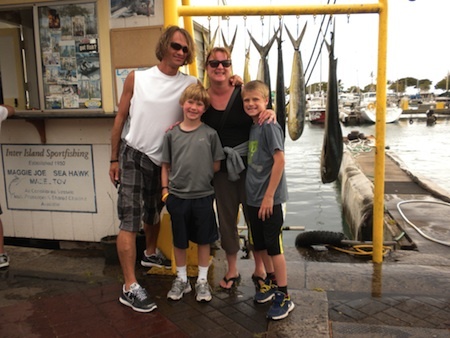 Mahalo to Courtney, Keith, Kimberly and Mike for choosing Maggie Joe Sport Fishing! The group joined us aboard the Sea Hawk on a half day sport fishing charter. They hauled in this tasty Mahi Mahi while deep sea fishing outside of Waikiki, Oahu! Aloha! Martin, Stoker, Brecken and Sandra with catch! 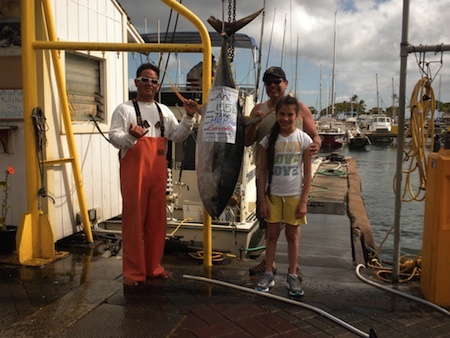 Mahalo to Martin, Stoker, Brecken and Sandra for choosing Maggie Joe Sport Fishing! The family joined us aboard the Ruckus on a full day sport fishing charter. While deep sea fishing outside of Honolulu, Oahu they hauled in 7 Mahi Mahi! Aloha!